Awww, I’m going to link this to my Awww Mondays post. Too cute. I hope he gets away! Roadrunner and Rocky & Bullwinkle were my favs. I still miss R & B. Nice to see the real deal in your photo! Meep, meep. Or is it beep, beep? 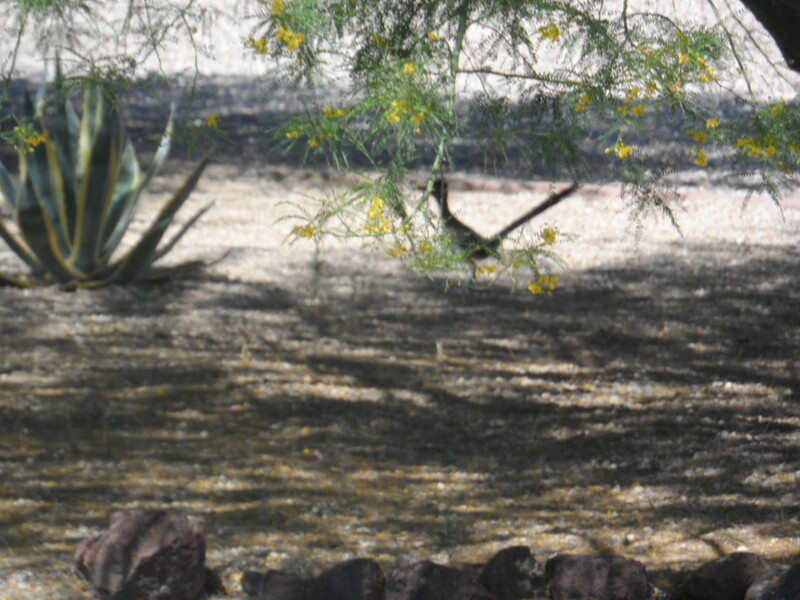 True story: The AJF was shocked when we moved to Utah and she saw her very first roadrunner. She actually thought they stood about 4 feet tall and were purple. I guess you cannot trust cartoons for an honest view of wildlife. I’m certain that the move to Utah was shocking in other ways to the AJF. Don’t destroy the kids’ view of Bambi. Roadrunner!!!!! I’ve wondered where you’ve been – hiding from Wile E. Coyote no doubt! Gotcha-Monday Teaser!!!!! Greenie for you! You can start your collection. I have a bunch already from you. In the front yard today and by the time the camera was fetched, he’s moving on. Why did Wile E. Coyote want that skinny anemic bird anyway? 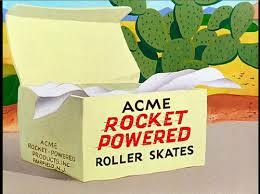 Because the Military-Industrial complex which includes Acme Mfg would go out of business. Bet the girls would like to try out the Wile E Coyote part……BOL! Um, yes. I’m just saying as a bird that they’re nowhere near quick enough. Maybe THAT is the Secret Egg Layer…. Oh goodie. I want to see Kali chow down on bird seed. Great shot but we all know Wiley never caught him (which was kind of sad in a way-no offense, Kismet). SQUAAAAAWK. Whose side are you on??? Just calling em like I see em. Sorry Lady K.
Crikey …… those things are for real?????? I thought they were only in cartoons. My Mum’s tall for a sheila. Her best friend, when she was at school (87 million years ago), was VERY short. Mum’s nickname was Bullwinkle and her friend was Rocky. It just depends where the boy friend was short. Beep beep we love road runner not so much coyotes. We have one road runner up the road, you can usually see him in the evenings. Texas is so big that a road runner has to work overtime. OMD, a REAL LIFE RR!!!! Very cool guys!!! Hey, do they really go’ Beep, beep’?? Awww! And it brings back so many fun memories of Saturday mornings! We’ve been thoughtful here and haven’t posted pictures of the coyote poop on our porch. We wish it were on our Porche. It is too hot to run. Everything is slowing to a crawl here. OK, you worms. Hibernate until October. It’s hot here, but your humidity would get me. I’d rather have our 110 with single digit humidity. I’d rather take 110 here (or more) than 90 in NY with 98% humidity. I was at a Pirates-Mets doubleheader in Shea when they ran outta beer in the first game with 98-99 (temp-humidity). They had beer trucks coming from anywhere with any brand of beer for the second game. I never heard that the official beer of the team ever objected. My grandpa are from Arid-zona. And da peeps say it’s a “dry heat.” So are an oven. But we get 110+ here lots, and sometimes it are humid 110+. All I gotta say is I is thankful for da pool and da A/C. Better an oven than a steamer. I’ve never heard on do that. Did she tell you that is was a secret? I thought not. It was her problem for not telling you what were her wishes (again). Yah he’d be wise and listen and head on down that road.